From the play Sekitori Sen Ryō Nobori performed at the Kado Theatre in the 5th month of 1849. A mica ground bust portrait of the actor Mimasu Inemaru I as Otowa in a mirror-like inset. The rest of the image is made up of the striped sumō pole and the dohyō straw ring. Hirosada has used every possible refinement in the production of this luxurious portrait. "The play Sekitori senryô nobori (Rise of the 1,000 ryô wrestler: 関取千両幟) was written in nine acts by Chikamatsu Hanji (1725-83) and others for the ningyô jôruri (puppet theater: 人形淨瑠璃), premiering in 8/1767 at the Takemoto Theater, Osaka. The first kabuki performance in Osaka may have been in 8/1775 at the Kado Theater. Two patrons of rival wrestlers attempt to raise money to ransom a beautiful courtesan, Nishikigi of the Osakaya, so they wager on a match between their wrestlers. Tetsugadake Dazaemon, fearing he will lose, asks Iwagawa Jirokichi to throw the match in exchange for his help in raising the money for Iwagawa’s patron. As this would guarantee the rescue of Nishikigi, Iwagawa agrees. 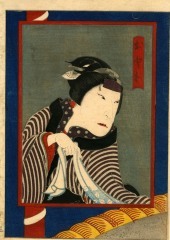 His wife Otowa learns of the plot, however, and cannot accept that her husband would ruin his reputation for his patron. She therefore raises the money in secret by the only means available — selling herself to a brothel. As the wrestling match is about to begin, Iwagawa is told that an anonymous source has provided the money. He is therefore free to compete unfettered, defeat his opponent, and capture his ranking. After his victory, he is shocked to learn that the donor was his wife Otowa." This information is taken directly from Osaka Prints. This is from a set of three actor prints. All three of them are illustrated in Ikeda Bunko, Kamigata yakusha-e shūsei (Collected Kamigata Actor Prints), vol. 4, Ikeda Bunko Library, Osaka 2003, no. 177.